Griffith ’s Valuation is the name widely given to the Primary Valuation of Ireland, a property tax survey carried out in the mid-nineteenth century under the supervision of Sir Richard Griffith. 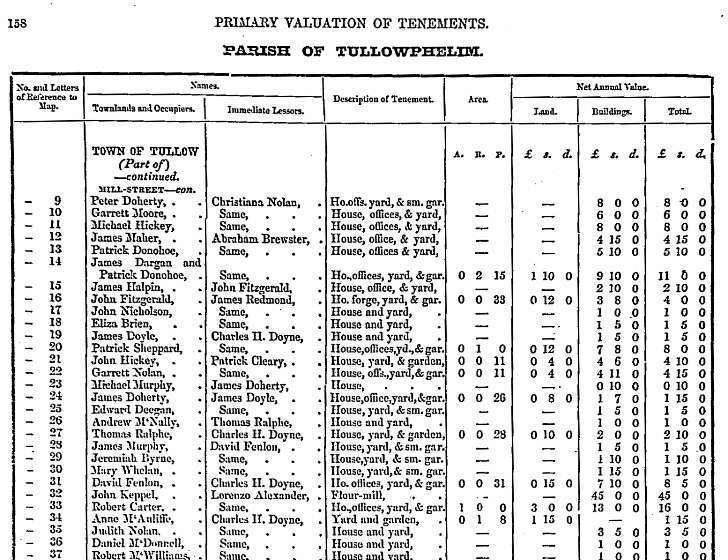 The survey involved the detailed valuation of every taxable piece of agricultural or built property on the island of Ireland and was published county-by-county between the years 1847 and 1864. The survey of Killeeshil and Clonaneese was undertaken in 1861. The records have been digitised and our available to view online through 'AskAboutIreland and the Cultural Heritage Project' an initiative of public libraries together with local museums and archives in the digitisation and online publication of the original, the unusual and the unique material from their local studies' collections to create a national Internet resource for culture.